And welcome to my newsletter for July, 2013! Please feel free to forward this to anyone you think would be interested in keeping up with me! To receive these newsletters regularly, please drop me an email or subscribe online from my website (http://www.JefMurray.com ) or at:http://groups.google.com/group/Mystical_Realms . Notices of events and items of interest are at the bottom of this email. • I have posted three new painting images on my website. These include “Fog on the Barrow Downs”, “Fledge”, and “Out of Arnor”. The first and last are located in my Middle-earth gallery (“The Third Age – The Lord of the Rings”), and the last is in my Narnia Paintings gallery. You can see all of them by going to http://www.JefMurray.com and clicking on the “Newest Works->Paintings” link at the top, left. • In addition to the two paintings, I have added some 9 new graphite sketch images to the Middle-earth, Narnia, Fairy Tale, and Soul and Spirit sketch galleries. You can see all of the latest together by clicking on the “Newest Works -> Sketches” link at the top, left my home page ( www.JefMurray.com ). All of my paintings and sketches are available as limited-edition, signed and numbered prints. See my www.JefMurray.com for details. • The first ever 2014 Jef Murray Chronicles Calendar is in the works! This calendar features images inspired by the Narnia tales of C.S. Lewis. Watch this space for more details! • I am honoured to have been asked as a guest to this year’s DragonCon in Atlanta. I hope to see many friends there this year as I participate in panels and other events! • I am equally honoured to have been invited as a guest to the Mythmoot II, sponsored by The Mythgard Institute (http://www.mythgard.org) This weekend of celebration and discussion will be held in December. Location to be announced soon…. Brother Aran, Charles, and Azarias spent midsummer’s eve touring the piazzas and avenues surrounding the Benedictine monastery. Brother Aran played tour guide, pointing out the many ancient and ofttimes cryptic pre-Roman structures that poked capitals and arches up through the veneer of shops, restaurants, and business suites. Charles and Azarias made full use of the the monk’s expertise, prying him with questions on architecture, art, history, and philosophy. As the day waned, they returned to the monastery to attend Mass, where Father Hildebrandt was the celebrant; afterwards, they retired to the Abbot Primate’s rooms for an early supper. At the abbot’s quarters, they were greeted by the abbot himself and by his beautiful but enigmatic ward, Sonja, whom Charles had been unable to get out of his thoughts since his last trip to Rome at Christmastide. She was, as ever, dressed in flowing eastern garb, including a partial veil that hid her sightless eyes. She was very young, but also very reserved, and her bearing and grace belied her age. The supper was simple and light: fresh oysters and langoustines, salad, tortellini tossed with fresh ripe tomatoes, basil, and mozzarella, all served with a crisp Orvieto. After these, the friends settled down to gelato and frozen ices; espresso, Amaretto di Sarono, Frangelico, Limoncello, and a host of other liqueurs, all set out for any who wished them. As was their custom, the four men then proceeded, with Sonja listening intently, to converse the evening away, variously tasting fine tobaccos from around the world, and engaging topics that always seemed to invert time: thus, they commenced with current affairs, discussing Italian and world politics, economics, and the machinations of nations; they then passed on to the sharing of previous personal adventures and mishaps; ultimately, they began to sample, like some great red wine that has been set aside to breathe until perfectly mellow, many of the ancient tales that they had heard or had uncovered over the years in their own researches. All four of these men were well versed in ancient tales. Brother Aran, a young monk with jet black hair and a slight British accent, was a medieval scholar; Father Hildebrandt, older but tall, slender, and greying at the temples, knew intimate bits and pieces of history and lore extending as far back as Egyptian times; Azarias, tall and inscrutable, with long grey locks and beard, came to be regarded among them as an authority on myths, and particularly those of the middle and far east, as well as of the Americas; Charles, the youngest, was an artist. As such, he was most acquainted with legends and theology as cast in the great works of art, from the cave paintings at Lascaux down through the ages and civilizations of Mesopotamia, Egypt, Asia, Europe, and ultimately the New World. As they shared their different thoughts and tales, at long last they turned to one of the oldest myths: that of the lost world of Atlantis. All eyes turned toward Azarias, and Charles noted, not without the slightest twinge of jealousy, that Sonja in particular became more alive and attentive once they all began to hearken to this singular individual. “Well,” said Azarias, after looking at the expectant eyes trained upon him, “there are certainly a few things that I can share, and I shall certainly endeavor to warrant the faith the Abbot Primate has expressed in me. “As most of you know, I have not resided in these parts for many years. Rather, I came from what you now call the New World, Charles’ homeland, where I have dwelt for time out of mind. Fr. Hildebrandt and I are old friends, but there were many years before our friendship began that I spent in travels throughout Asia and the Americas. “When it comes to the great tale of the Flood, and of Atlantis, I believe the record is clear that there was such an event. This is evidenced by the pervasiveness of the story among all cultures, as Fr. Hildebrandt suggests. But the fossil record is more ambiguous, and evidence for a worldwide flood seems less compelling than that for a massive localized flood that we all “remember”, culturally. I believe this is because all of mankind’s ancestors either survived that flood or came to know of it due to its catastrophic nature and aftermath. Moreover, I believe we can say with some certainty where the realm of Atlantis once was found, and by all accounts that was in the center of what is known as the Atlantic Ocean. “One may call it prophetic, or simply good scholarship, but it seems to be the case that J.R.R. Tolkien got much of his history of Atlantis correct. And, although many of his tales about the peoples of his Númenor are certainly fabricated, yet there are shards of truth in them, at least as evidenced by the legends of the peoples both of the Old and the New Worlds. “Let me, then, give you all a brief history of Atlantis, based on the accounts to which I have come to give most credence. I don’t pretend that this story is exactly as events unfolded, but I believe it to be close, and the most compelling I’ve heard. I will also attempt to use the names associated with the actual history that I’ve come to believe are closest to the true ones. Azarias looked around at his audience. None stirred. He smiled, and began…. “An interesting thought,” said Azarias. “But, as I was saying, when the world was indeed new, and young, it was divided, East and West, through the great expanse of the Atlantic, not of the Pacific. I will not comment on Tolkien’s claim that the great ocean divide that did exist once marked the edges of a flat earth, other than to observe that it was certainly a greater gulf then than now. “Amidst the waters at this ‘edge of the world’, however, existed Atlan, a modest island nation, perhaps of the size of modern Ireland, but certainly no larger. It was the ancestral homeland, as I’ll come to explain, of the peoples we have come to know in our day as the Maya, but the Atlan civilization existed many thousands of years before the Maya fled their original home and much later sought to rebuild their former glory in the Americas. “The people of Atlan were a gifted race, and since they lived in what to us seems a mystical age, many of the myths and tales we have heard of strange creatures — spirits walking in the flesh, angels, and supernatural beings of all sorts — were not myths then, but much closer to realities. The people of Atlan were taught by higher beings, both devils and angels, if you will, but in that day the distinction was not as clear as it is in our own. Knowledge was pursued initially in a wholesome fashion, for the good of the people of this island nation. But that changed over time. “There were in those days men of great skill: human, certainly, but gifted mentally and trained in techniques that have never since been duplicated. They were known as the dhArmikis, a word that might translate as “alchemists” or “conjurors”. They came to be regarded as gods by those with whom the Atlani traded, although in reality they were simply men with unusual and potent mental gifts. They could manipulate objects, and often people, with the sheer power of their minds. They could also sometimes reach into the unseen world of spirits, and enslave beings from that realm, or so they believed, being deceived. With these, they manipulated the forces of nature, even to the point of being capable of creating and circumventing natural disasters and calamities. “These men learned, however, that their ability to manipulate the world around them was circumscribed by what we would now call genetics. And so, to overcome even this barrier, they began a great and terrible effort to overcome the limits of their own bodies and brains. Forsaking the cautionary teachings of their ancestors, and disowning the friendship and love of the Creator that their forebears had held, they sought to understand and conquer the mysteries of life itself. They began breeding programs to produce individuals with ever greater psychic gifts, and developed technologies that hybridized the human brain with the genetic material of nonhuman creatures. In so doing, they abandoned all wisdom and prudence. “It is true that the breeding programs began simply, and with seemingly good intent: to lessen the effects of and to eliminate disease; to strengthen their children and increase their vision, their intelligence, and their beauty; to heighten endurance and fortitude; to enhance their psychic gifts. Yet, with each new discovery and each new advance, there came unforeseen consequences. “New generations might be more intelligent,” continued Azarias, “or they might exhibit telepathy or psychokinesis, but these same individuals would be physically hideous, or might manifest diseases or stuntedness of growth that could not be remediated. The splicing of genetic material from nonhuman species, and even the melding of spirit creatures with humans, was pursued to overcome these setbacks, with the result that ever more monsters and horrors were created. But every regress brought with it additional knowledge, and generations of pseudo-men were created that could serve as slaves to a smaller and smaller elite class. The dhArmikis were themselves ruthless men who were exalted by lesser folk because of their superhuman capabilities, but they came to regard the ever waxing reach of their own power as the only worthy goal of their lives and the lives of all that they conquered and spawned. “Where once the island nation of Atlantis had been fertile and lush, it soon became overpopulated with mutated abominations. Creatures that we would now call dragons were invented as playthings. Horrors such as succubi, trolls, giants, vampires, goblins, and even shape-changing beasts were spawned, experimented on, and either destroyed or shackled for further testing and dissection. Naturally some of these, along with myriad slave “models” and representatives of failed human genetic lines, escaped, but the waters surrounding the island itself were a barrier to their exodus into the greater world, and many of these took refuge in the caves and poisoned wastelands of the island. Yet, the land itself became too small to hold all of the burgeoning residents of Atlan, so great energies had to be expended to create more land for the exploitation of the dhArmika overlords. “The emperor and his council bred new slave creatures to aid them in the process of land creation. Selected for their psychokinetic power, they were corralled, grub-like, in vast underground caverns, kept alive only as long as they were able to harness their minds to the task assigned them. And that task was to raise the island of Atlan, thrusting the rock that underpinned the land above the tideline. Using their psychic energy as pillars, these semi-human thralls conquered the seas, and where once the tides ebbed and flowed, new temples to science and eugenics were raised, and ever larger breeding farms became possible. “This raising of the island nation upon the shoulders, if you will, of the only recognized god of the dhArmikis, that is, their limitless ambition, formed the basis for another pervasive myth, that of Atlas raising the world upon his shoulders. But, I digress…. “Yes, blind, like you my dear,” said Azarias. “She was born without sight, but, despite having not been the product of any breeding program, she was nevertheless more psychically gifted than even the most powerful of the dhArmikis. For, you see, she was able to travel through time; not in her body, but in spirit. She cast aside her physical form and traveled forward, discovering long before others came to know their own peril how dangerous was the path on which the dhArmikis were fixed. “Her twin brother, too, was gifted, but his was the gift of communion. Kiran could converse with beings in the spirit realms; but because he did not seek power or position, guiding Messengers, or angels as we might call them, surrounded and protected him, and they would warn him of the machinations of the dhArmikis elites and of the deceits of those spirits that would thwart him and his sister. “These two became beacons of hope for those of the Atlani who could perceive the hell into which they and their world were being cast. With the twins as their leaders, the Sazukbis, or “Believers”, as they called themselves, counseled against the breeding programs, insisting that men, and even partial men, were equally worthy of dignity and were fashioned, as were all men, in the image of the Creator. They fought against the enslavement of other peoples, and against the defiling and corruption of their offspring. They sought to return worship of the Creator to the public square, and into the halls of the ruling classes. But they were ignored, or ridiculed, and over time, they became the scapegoats and new victims of the ever-ongoing experiments. “Horror followed upon horror. Soon even the vaunted dreams of the most ambitious of the dhArmikis were corrupted beyond all recognition, as they sought to satisfy their ever growing lusts for power and pleasure. Meanwhile, the growing destitution and cries for justice of the common folk of Atlan remained unheeded. “Shakti perceived that two futures lay before her people, but knew not which would prevail; Kiran took counsel with the Messengers, and was told by them to gather any of the Sazukbis that he could and flee the island, for by now the prayers of all the misshapen monsters and slaves of the dhArmikis had reached unto the highest heavens, and the divine vengeance of Vidhatr, the all-Creator, was at hand. 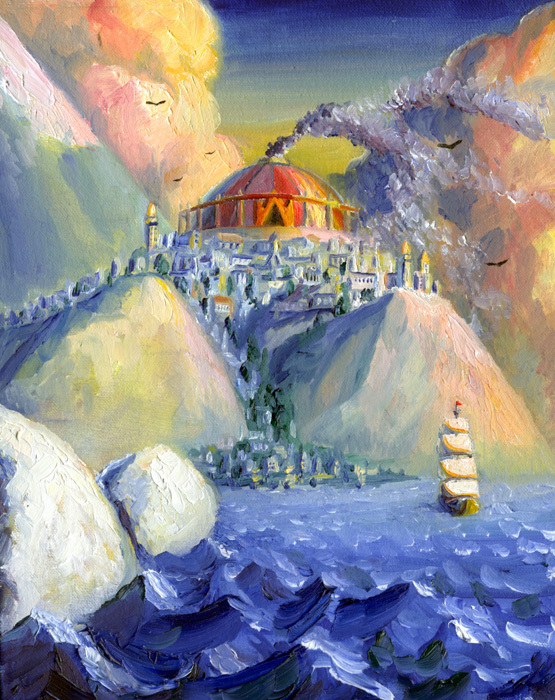 “So the twins gathered as many sailing vessels as they and their followers could muster, and they fled Atlan, taking with them nothing but knowledge of their own history and a few treasured tools and artifacts from their once-glorious world. And even as they set sail, a pestilence broke out among the breeding farms, spreading like wildfire through the mired ranks of the mutated spawn of the dhArmikis. It took the form of a virulent contagion that turned each creature into a ravenous beast, and it spread by tooth and claw, taking, like some great crimson wave, the lives of all who came into contact with those infected. All of the workings of the great technological Atlan empire came grinding to a halt, and when the contagion finally reached the subterranean caves, those who upheld the great rocky mass of Atlan itself succumbed. The result was the shattering of all of the lands as the living rock plunged back into the ocean depths and the purifying waters rushed in, not just to their original shores, but, driven by some final spasm of psychokinesis, high, high over the heights of Atlan, toppling all and leaving nothing but debris to mark where the proud island nation once had stood. “The ships of the Sazukbis were scattered in the apocalypse. Some were flung eastward, and others to the west. Of two score ships, only six were believed to have survived; three landed on the western coast of what is now Europe, and three, so it is said, were flung deep into the Americas, coming at last to rest in the deserted regions of Central America. Those ships that landed in the Americas, and all upon them, including Shakti herself, were lost and were never heard from again, although Kiran came to know of their whereabouts through the Messengers. Those that landed in the Old World thrived, and over many generations, they mingled with other peoples, ultimately founding a race that came to be known as the Canaanites. But, that is a very long tale in its own right, and we have no time for it now. “Thus, rumours of the destruction of Atlan spread throughout the western world and to all peoples there, and these rumours traveled eastward, becoming part of the great heritage of legend and myth shared by all of humankind. But, Kiran never forgot his sister, and he laid an oath upon his offspring that they should someday seek for Shakti and their lost brethren, even if that quest took them to the very edges of the world. “Some of his tribe came ultimately to the British Isles, and they became known there as the Picts. These people, in obedience to the will of Kiran, eventually set sail seeking for rumours of Shakti, and they became the founders of the Mayan nation. “But, despite their long search, they never came to discover what became of Shakti and her lost ships. What they did find, to their horror, was evidence that many of the misshapen creatures spawned in Atlan had survived her destruction and had slowly spread, throughout the Americas, and from thence into Asia, and even to Europe. So, the sins of the fathers were visited upon their children, and are so unto our present day, despite the wrath of Vidhatr. There was a long silence. The friends looked up, blinking at each other, as if waking from a deep sleep. None seemed inclined to comment on the tale until Sonja raised her bell-like voice. “O believe it meant ‘the powerful one'”.